3. Are You Committing A Crime Against Yourself? Photo of Pamela Quinn by Stacey Downey. Are You Committing A Crime Against Yourself? Even if you do not know your prakruti or dominant dosha(s), your state of balance (vikriti), or what seasonal eating means, you know what to eat and what not to. It’s generally accepted, well documented, and well researched a plant-based diet of whole grains, beans, vegetables, fruits, nuts, seeds, and oils is best for body and mind. Sugar, alcohol, caffeine, processed food, fried food, or a diet rich in animal products is not. So, knowing this, why is it so hard to make consistent good choices? Why do you knowingly make choices that harm you causing weight gain, disease, inflammation, and low immunity? In Ayurveda, we call this prajnaparadha or a crime against the intellect. This is the act of knowingly doing or choosing something that causes harm. It’s a choice to participate in a thought, word, or action creating tamasic or dark energy in the human system. As it relates to food, it is choosing the less nourishing choice appropriate for your dosha, your state of balance, or the season. There are three primary reasons we commit crimes against ourselves including misusing the sense organs, misusing time, and misusing speech. As it relates to the sense organs, we overindulge the eyes, ears, nose, mouth and skin. Translating this, it is basically living a pretty stereotypical life in the 21st century. You know the drill. You get up every single day and simply try to do your best to keep up with spouses, children, work, community, and of course technology. Too much is coming at you at any one time, there is no time for self-care, and there is no time to plan and prepare proper meals. Constant movement without adequate quiet, rest, and solitude creates an imbalance of Vata dosha in the mind. Vata dosha is the energy or force created due to the tension between the elements space and air. Space intends to hold everything together, while air intends to expand. The conflict of intentions creates a tension called Vata dosha. Vata is responsible for movement in the mind and body. Aggravated, it causes one to feel anxious, worried, and scattered. It causes sleepless nights, confusion, memory loss, inability to focus, inability to listen, and inability to relax and calm down. Quickly grounding to this dosha is comfort food in the form of the heavy, dense, and sticky taste known as the sweet taste in Ayurveda. Foods in this group are breads, pastas, sweets, and meat. While a little bit of any taste is good, the sweet taste is more calorie dense and includes the majority of the fats in our diet contributing to heart disease and weight gain. Salt, in particular quickly grounds Vata dosha particularly as a cheeseburger, French fries, or pizza. The same is true for sweet especially in the form of cookies and treats. Quickly eaten you feel safe, full, and satisfied. Cravings like this are natural and a person intuitively in touch with the wisdom of the mind and body will crave appropriate foods. As discussed, Vata aggravated, craves salt and sweet to quickly balance. Pitta dosha is the tension between the fire element’s desire to transform with heat and the water element’s desire to soothe with cold. Aggravated, Pitta craves cooling tastes of sweet and bitter. Kapha dosha is the tension between water’s desire to change and the earth’s desire to stabilize. Aggravated, Kapha craves the uplifting tastes of bitter and astringent. Translating this, if you are experiencing too much movement due to the stress of constant movement and chaos, you will become attached to salty, sticky foods as Vata is the first energy to go out of balance and demands quick impulsive action to calm. Over time, however, if you continue to live out of balance the Vata dosha enters the tissue system of the body and creates ignorance within the natural intelligence of the body. Vata creates a pathway for Pitta and Kapha to follow. The body and mind become so confused you consistently crave the very foods and activities causing you harm. So, while the Vata imbalance progresses to a Kapha imbalance, you would assume your cravings for heavy and dense food would shift to uplifting food, but they do not. This is why a person Vata aggravated will skip meals, stay up late, and crunch on ice. A Pitta aggravated person will work excessively, work out in the extreme heat, overindulge in food, and eat strongly spiced food. A Kapha aggravated person will crave sweets and sugars, refuse to move the body, and sleep excessively. If asked, they will tell you this is what they crave. They will also tell you it makes them feel better. All of the problems noted above live in the mind and ultimately affect the body. Stress, as we currently understand it from a Western perspective, stimulates the craving part of the mind. Stress also releases hormones enticing your body to hold fat. Basically, stress makes you crazy and sick. Ayurveda offers a disciplined approach to bring the body and mind back to center. The key to balance is moderation. The following is advice from the Ashtangahridaya. This collection of advice from Ayurvedic physicians speaks to daily routines, seasonal routines, traveling, cleanliness and much more. While the rules are simple, the implementation is difficult because you are craving that which opposes you, you have firmly established habits of the mind you are not conscious of, and it takes time to change the patterns of your daily life causing roadblocks and ultimately frustration. For now, don’t worry about your dosha or state of balance. Simply accept that you are living a Western life and are out of balance and need to learn and implement some very basic principles of Ayurveda. Go to bed and relax with no electronic stimulation around 10pm. This is when the energy of Pitta arises on the earth creating a hyper metabolic state for you to digest food, impurities, disease, and stress. If you are used to going to bed much later, simply move the time back about 15 minutes every few evenings. For example, if you go to bed at midnight, try to be in bed by 11:45 and then 11:30 and so on. Arise about one hour before the sun and take advantage of the energy of Vata telling you and the birds to get up and get going. This is the perfect time for self-care and planning. Embrace a personal spiritual practice or sadhana upon rising. This includes movement of walking or yoga, prayer, meditation, and contemplation. A practice of keeping a journal for your contemplation is highly encouraged as a means by which to relieve stress and notice the patterns of the mind. Eat breakfast after your morning practice. Eat dinner around 6 pm and not within 2 – 3 hours of bedtime. Go for a leisurely walk in nature at least once a day and preferably after a meal. Foods are organic, fresh, whole, as local as possible, and unprocessed. Favor beans, grains, vegetables, fruits, nuts, seeds and oils. Limit meat consumption including eggs to 3 – 5 servings each week. Avoid food in bags, boxes, tubes, and containers as much as possible. Limit eating out to 2 – 3 times each week. This means you are going to have to plan, shop, and cook. Cook in bulk making sure you have food quickly available on a daily basis for lunch on the go and dinner. Eat 2 – 3 cups of food at any given meal and not more. In Ayurveda, we do not snack. If you need to wean this habit, consider switching to healthy snacks of blanched vegetables, nuts, seeds, and dried fruit until you progress to not snacking. Drink room temperature water and hot herbal teas not in excess of 4 – 6 servings of water each day. Limit juices, caffeine, and alcohol. There are probably a lot more that popped into your head as well. The truth, sadly, is if you aren’t willing to change your life and even embrace this simple routine, you are very attached to the crimes you are currently committing against your intellect and until you reach your own threshold for pain you will not change. Everyone’s pain point is difference. Some suffer enormously by putting on five pounds or having acne. Others must experience the extreme of obesity, diabetes, heart disease, eczema, fibromyalgia, arthritis, and even cancer before they are willing to change. In all honesty if you cannot commit to the above, your stress levels are never going to change and your life is never going to be what you want it to be. Identify a few places in your life you might make changes and any personal roadblocks that arise. Share your experience of this article in the comments below. If you liked this guide then share it with your friends! The most difficult part of healing with Ayurveda, is that we must take responsibility for our own healing. “Duh,” you might be thinking. But easier said than done. I always say that these changes are simple, but they are not easy. It’s also important to know that that is okay. And that slow, steady changes are what are going to stick. There is a big list here, and a lot of information. Pick out the first 2 things that make sense to you, and don’t worry about the others. Sustainable change is lasting change. And it also helps to have a positive community around you to help you stay on track. Adena Rose Bright is an Ayurvedic Practitioner and Panchakarma therapist, professionally trained in The Arvigo Techniques of Maya Abdominal Therapy. 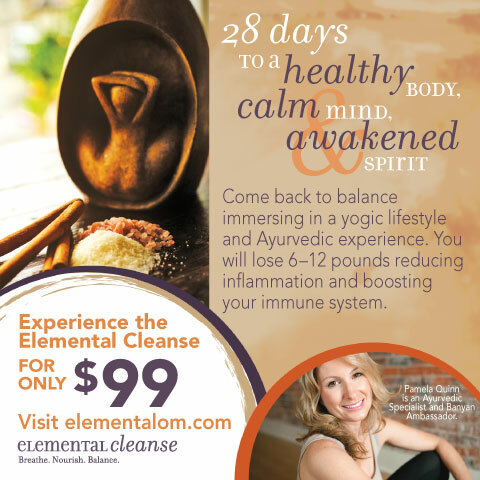 She helps women heal from painful menstrual cycles and stubborn digestive complaints. Adena is the founder of Adena Rose Ayurveda and the online program The Healing Diet.